Creative Certificates was built in order to provide you with professional looking certificate templates that you can easily customize to fit your needs. You don’t need to download any software or have any graphic design experience. It takes less than a minute to customize each editable certificate and you can add your own photos, logos, clip art and text. Just type in your details and save or print the certificate. 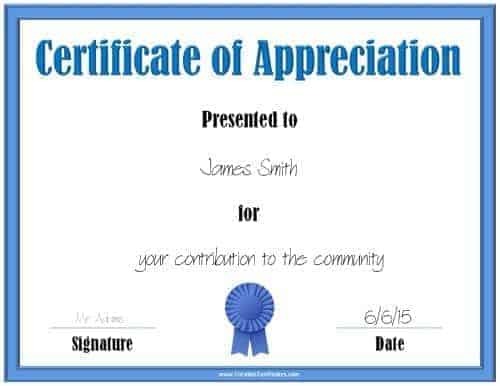 The printable certificates are free if you print with a watermark and it costs only $4 per month to remove the watermark from all templates that have a premium version. For only $4 you can remove the watermark off an unlimited number of templates each month. There is also a wide selection of free gift certificate templates. Each gift certificate template can be personalized with our free online gift certificate maker or with Microsoft Word. No software is required. In addition to the ready-made printable gift certificates, we also have a free gift certificate maker that will enable you to create your own custom gift certificate using any background from more than 60 available designs. You are sure to find a design that you love! There is a large selection of free award templates on this site. Each template can be customized to your needs and all of the text can be changed. You can also add a logo or image if you want. The difference between the editable certificate templates and the ready-to-print certificates on this site is the level of customization possible. On the ready-made printable certificates, not all of the text can be edited, whereas on the templates all text can be changed. Award certificates can be used in the workplace, at school, home, for donor recognition, by parents or teachers… The possibilities are endless! Customize the free templates for certificates with our certificate generator. You can change the text, select a border and add an image/logo to create a printable certificate to suit your needs. To make a certificate open our certificate maker. Please note that there is no charge to customize the certificate images on this site unless you want to remove the watermark (CreativeCertificates.com). Children love to be praised, recognized and rewarded. A printable certificate can boost self-confidence, modify behavior, encourage participation, motivate students and recognize achievements. Certificates can be successfully used to motivate children to study and behave well in class. You can award them for excellence, effort, participation and good behavior. You can even add your school logo! and many more award certificates. Use our certificate maker to customize any award if you didn’t find what you were looking for. A selection of sports certificates for physical education (PE) and various sports including football, baseball, running, basketball certificates and many others. We also offer generic awards if you do not find a specific sport. Use award certificates in the workplace to promote excellence. Criteria can be based on knowledge, skills and/or behavioral competencies. They can also be used to help motivate employees as part of a recognition program. If employees successfully meet their goals, recognize their achievement publicly and award them with tangible rewards. Tangible rewards do not necessarily have to be in the form of money or gifts. Instead, use a printable certificate to reward an employee. This will help motivate employees, build self-esteem and strengthen company pride. 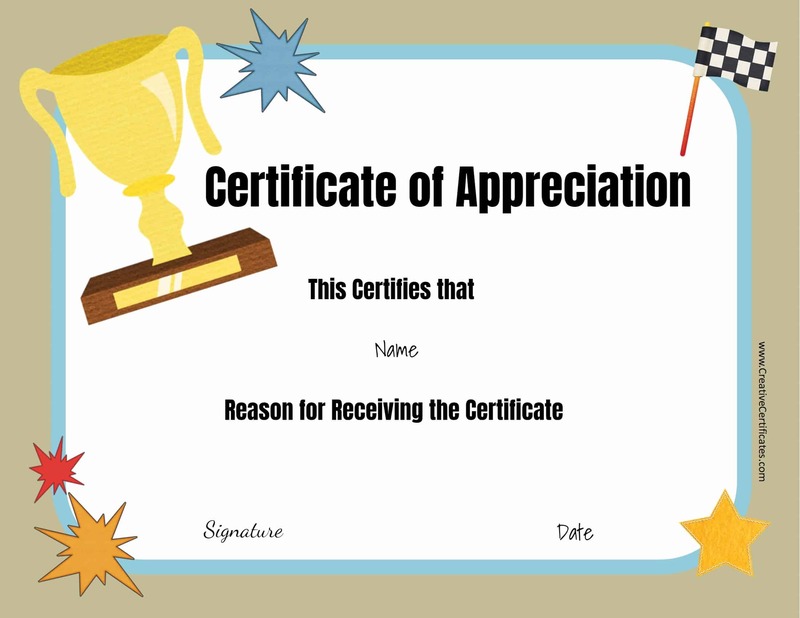 You can either use one of our ready make certificates of appreciation or employee of the month certificate or create your own certificate template with our certificate maker and selection of certificate borders and designs. You can choose the border that is most appropriate for your company. Since you can customize all of the text, you can use the certificate for any purpose. You can also choose the award ribbon if you want to use one. You can add your company logo to make your certificates look more official and professional. If you are looking for something more fun then try our funny employee awards. If you prefer to make the award certificate yourself then you might want to try a certificate border or a blank certificate from the huge selection available. 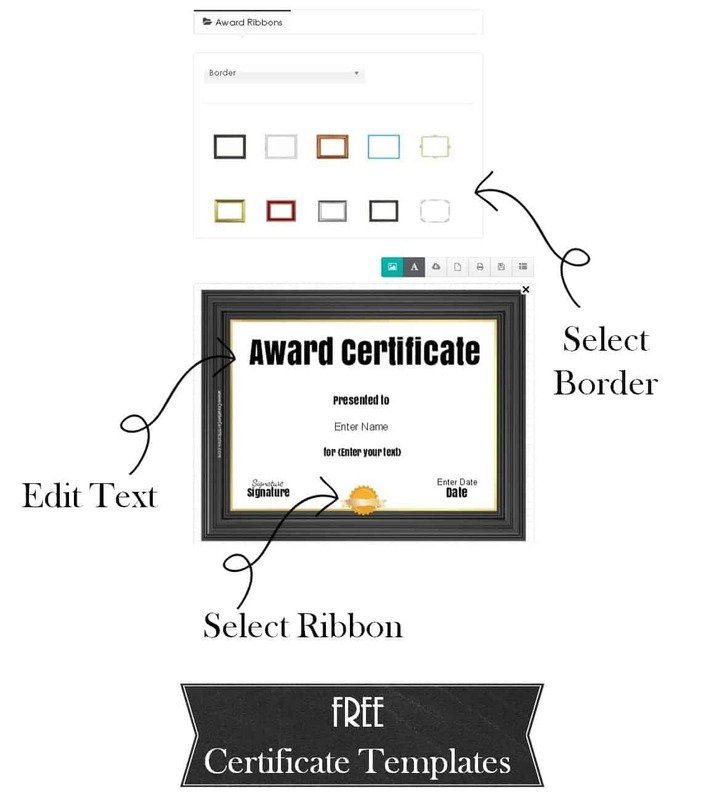 Use our free our certificate maker to add text and images to the customizable awards or just print a blank border. To download as a PDF document, click on the page icon. To download as an image file, click on the cloud icon. Once you have customized your certificate you can then download it as an image or a PDF document. In certain cases, it will only download as a PDF and not as an image. Once downloaded, it will be saved in your downloads folder unless you have changed your browser’s custom settings. Open the file and preview before printing. You might need to change your computer settings to ensure that the certificate prints on one page. Some printers will have the option to select “fit on page”. If you have any problems printing or customized then please see our FAQ. You can use the awards for personal, educational and commercial use. If you place them on a website then you must link back to this site. You cannot remove the watermark unless you purchase a premium membership.